For the best beaches in Phuket, in the Western coast, Villa Samakee in Bang Tao beach is the best place for a tropical holiday with friends and family. The five-bedroom retreat is great for large gatherings especially if you are traveling for a private event like a wedding or a birthday party on the beautiful island. The traditional interiors marked by intricate Asian décor and polished wooden floors compliments the natural greenery that is abound outdoors near the private swimming pool! The master bedroom at Villa Samakee is furnished with a king-sized bed and is found on the upper floor. It even has its own living area with plush armchairs and an entire wall with glass that looks out to the beautiful scenery. A wall-mounted TV is for your entertainment, and many traditional artefacts to decorate the space. The en-suite bathroom is another luxurious space with sliding windows looking at the garden and a tranquil bathtub. The second bedroom is also furnished with a king-sized bed and is similarly furnished making its almost the second master bedroom. The en-suite bathroom is furnished with a bathtub and other amenities. The three guest bedrooms are furnished with singles and twin beds for more people and open out directly to the garden. Each of the bedroom is air-conditioned and has an en-suite bathroom. A well-landscaped outdoors with lush foliage and a 20-metre private swimming pool, well-manicured gardens and a traditional sala home to a comfortable sitting area for the guests is all you could ever hope for from a private villa! The dense tropical vegetation fringes on the periphery of the villa giving you a private and exclusive space to enjoy with friends and family. A Jacuzzi is also accessible to the guests for lounging post-swim! The private swimming pool features a mosaic-tiled surface that reflects beautifully on the surface, inviting you in to take a dive and swim laps, splash around or play some water games under the tropical sun! Pro tip: Do not forget your sunscreen and a beach hat! The pebbled pool deck is furnished with rattan sun loungers with large umbrellas to keep you in the shade and if you wish to take an afternoon nap! Beside the lavish swimming pool, you will find the well-furnished and contemporary living area of Villa Samakee with a traditional Thai ceiling sporting polished wood for a clean and sleek look. The living area is furnished with comfortable sofas, wooden flooring, and a coffee table with a polished top. With glass sliding doors opening out to the swimming pool, you have direct access to move easily. There is selective artwork on the walls along with Buddha sculptures that don the corners. A media room with a cozy ambiance, carpeted floors and plush couches you would just want to lie back on, as well as large flat-screen TV with surround sound is the perfect spot for everyone to come together and relax while enjoying a movie or two. A super sunny dining area with a 12-seater dining table, a high-vaulted ceiling, luxurious décor, and views for days is at your disposal to enjoy the most lavish meals! The kitchen is fully-equipped with modern appliances and amenities as well as a breakfast table for quick bites! As part of the Layan Estate, the villa offers exclusive services to its guests to ensure that your stay is smooth and memorable. The chef can prepare your meals for you as well, at added cost. If guests need additional services like car or driver, they can request the staff to make necessary arrangements. 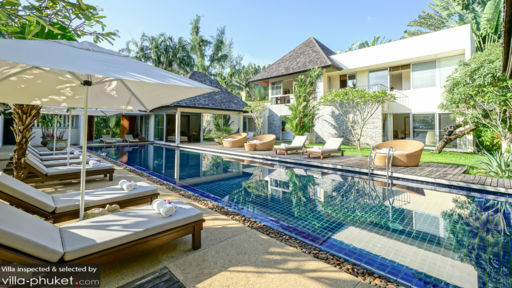 The villa is located right on Bang Tao beach, giving you direct access to the sandy shores and cool waters where you can play and frolic on the sand. There are many restaurants that you can try out including the famous beach clubs like Nikki Beach Club and Dream beach club!